Guignardia leaf blotch of Aescelus produced by the fungus, Guignardia aesculi, is becoming evident on buckeyes and horsechestnuts in many areas of Ohio. The fungal spores require moisture to spread to new growth in the spring and to germinate to initiate foliar infections. Infections and resulting symptoms then progress rapidly during warm summer months. The disease symptoms are generally described as zonate lesions on the leaflets that are often surrounded by a yellow, chlorotic halo. The lesions are at first small, reddish brown and often bounded by the leaf veins. They eventually expand to become large, dark brown blotches. 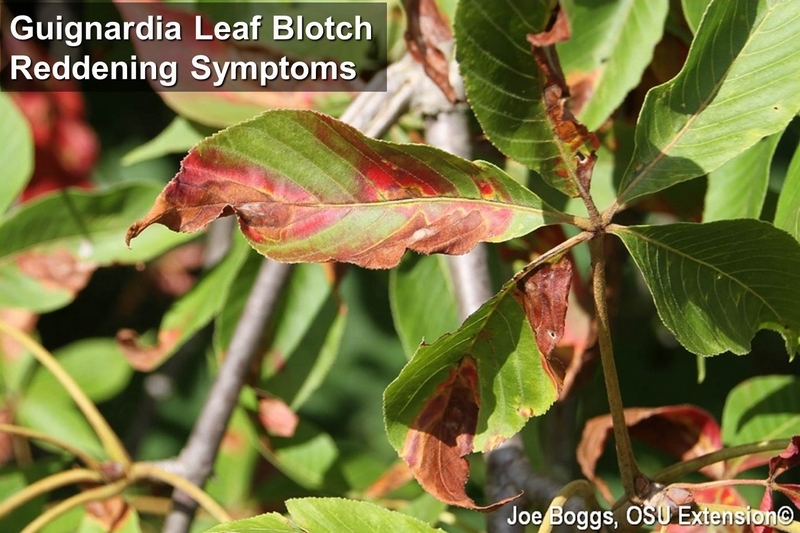 Heavily infected buckeye and horsechestnut trees may appear scorched as the brown leaf blotches envelop entire leaflets. However, last season and again this season, I'm seeing Guignardia leaf blotch on Ohio buckeye (Aesculus glabra) trees in southwest Ohio with zonate leaf lesions that are various shades of red; from crimson to brick red. While some browning is evident, red is the dominate color scheme. Last season, the affected trees eventually looked like they were showing unusual early fall colors with red replacing amber; the fall color normally associated with Ohio buckeye trees. I do not know why the Guignardia leaf blotch symptoms are so different from the "norm." But, it's important to note that plant disease symptoms do not always appear as expected based on our written descriptions. Indeed, plant pathogens as well as plant pests could care less what we write about them!